Tomorrow Wednesday, Atletico Madrid Vs Barcelona and Benfica Vs Bayern Munich will close the quarter-final second legs and it will be known what four teams will compete to take a place in the 2016 Champions League Final at Milan. Betfair invites you to enjoy both fixtures offering two fantastic odds to bet on these exciting matches. Although FC Barcelona is going through a complicated moment after losing its two last matches in the BBVA Liga, the Catalonian team is the clear favourite to pass the heat. Barcelona got a positive score in the first leg played in its stadium and it faces this second leg with optimism and excitement. No team has won the Champions League two consecutive editions and Barcelona wants to break a new record. If you think that Barcelona will beat Atletico Madrid in minutes and thus it will take a place on semifinals, this promotion is perfect for you! 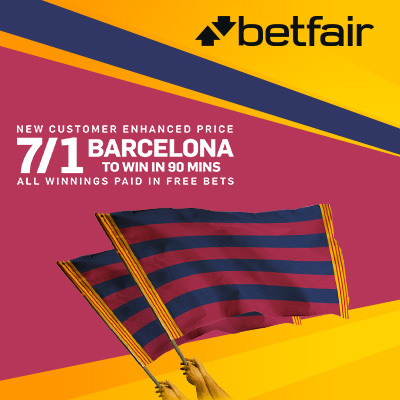 Betfair offers its new customer an unbeteable odd of 7/1 to bet on Barcelona! Are you interested? Open a new Betfair account using the promo code ZFBCBF – You can only take part if your account is registered in the UK or Ireland. Place a pre-match bet (max stake of £/€10) on Barcelona to win in 90 mins v Atletico at 7/1 in the ‘Match odds’ market. Remember that all winnings will be paid in FREE BETS and that if your bet loses you might receive a maximum stake of £10 to keep betting! Moreover, betting on this Champions League fixture will give you the opportunity to qualify for up to £100 in free bets (£20 free bet awarded with every 5 x £10 bets). Enjoy the Atletico Madrid Vs Barcelona with Betfair and make money with this fantastic promotion!! Bayern Munich is the team that got the best score in its first leg match. The German team achieved to score one goal keeping the clean sheet and it is the clear favourite to take a place on semifinals. Tomorrow, Bayern Munich will visit the Estádio da Luz to face a very hard match against Benfica, one of the surprise teams in this new Champions League edition. 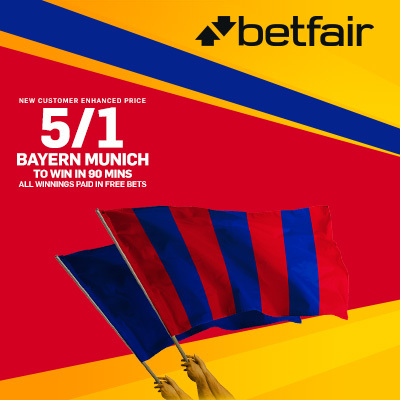 If you want to make money with this exciting match, Betfair offers its new customers an irresistible odd of 5/1 to bet on Bayern Munich! It sounds great, doesn´t it? Open a new Betfair account using the promo code ZFBCBG – You can only take part if your account is registered in the UK or Ireland. Place a pre-match bet -Max stake £/€10– on Bayern Munich to win in 90 mins v Benfica at 5/1 in the ‘Match odds’ market. But this is not all! You will have nothing to lose because Betfair will give you up to £/€10 as a free bet if your bet loses! Then, hurry to join Betfair today and take advantage of this great opportunity! You only need to spend two minutes registering and cross your fingers! But remember that this is not all! As always, for every 5 x £10 bets placed and settled, you will receive a £20 free bet (£100 max bonus in free bets). And if your bet is succesful Betfair will payout your winnings enterely in free bets within 24 hours! The Emirates FA Cup quarter-final replay between West Ham United and Manchester United will take place at the Boleyn Ground on Wednesday 13 April. The expectations are extremely high because the Red Devils are one place above the Hammers in the Premier League table at the moment. Moreover, this match is their only opportunity for both teams to win a trophy this season. It is time to pick a side and Betfair offers its new customers a fantastic promotion with two great odds to bet on whatever team you think is going to pass the heat! Taking advantage of this offer will give you the chance to receive a max bonus of £/€100 in free bets! Enjoy the West Ham Vs Manchester United with Betfair and make money with this fantastic promotion!! Moreover, you have nothing to lose because if your bet loses you might receive a maximum stake of £10 to keep betting.